Thanks to Valentine’s Day, the month of February is one which is perhaps most well-known for being a time for romance and the celebration of relationships. 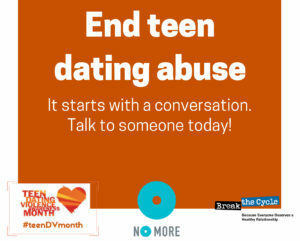 For the past eight years, however, the U.S. Congress has also designated the month of February as a time to highlight and bring awareness to the all too common problem of teen dating violence. Statistics show that approximately 1.5 million American high school students per year suffer physical abuse at the hands of a dating partner, while an estimated one in three teens is a victim of emotional, physical, sexual or verbal abuse from someone he or she is dating. One in 10 high school students reports being purposefully slapped, hit or otherwise physically hurt by a boyfriend or girlfriend. The problem does not stop at the high school level. Among college women in the U.S., 43 percent have experienced abusive or violent behaviors in a dating relationship, while one in six has reported sexual abuse. A total of 36 percent of college student has provided their partner with passwords to their personal computer, email and social media accounts, putting themselves at an increased risk for experiencing digital dating violence. Of college students who have not personally experienced dating violence, 57 percent claim the problem is difficult to identify, while 58 percent are unsure of how to help a peer who is in an abusive relationship. According to its community development director, Greta Rich, the Janelle Grum Family Crisis Center of East Texas strives to raise awareness about the issue of teen dating violence through outreach programs such as Phase One, which is currently presented by the center on the campuses of Stephen F. Austin State University and Angelina College. “What we do there is prevention,” she explained. “So many times, the teenager or the college student doesn’t even recognize what teen dating violence can be. According to Rich, many cases of teen dating violence can be attributed to alcohol. “A lot of times, that’s the scenario, is that prior to the occurrence, they could have been drinking,” Rich said. Rich explained that the center also encourages teens and college students to be aware of their surroundings when attending parties or other social functions and noted the importance of not leaving drinks unattended. “It’s common that people slip things into drinks when people are at parties,” she pointed out. Rich defined dating violence as “any time anyone is just being controlling,” adding that perpetrators can be either male or female. “If they’re controlling and not wanting their partner to even speak with other people, if they follow them, if they want to know where they are all the time – those are some of the things that are characteristic of a bad relationship and dating violence,” she said. In the event that an incident of dating violence is life-threatening, Rich said, the best course of action is for the victim, a parent, or peer to call 911 as soon as possible. Rich acknowledged that for victims of dating violence, making a phone call is not always a possibility. Text messages may be sent 936-552-9256.